We made it! Happy Friday lovebugs! Here are my favorite recipes this week. In a large bowl, combine the two kinds of sausages and set aside. In a skillet, with 1 tbsp. of vegetable oil, sauté green bell pepper, onion, and garlic until tender, about 5 minutes. Remove and let cool for 5 minutes. Add the veggie mix to the bowl of sausage. With your hands (jewelry off! ), mix the meat and veggies together until just incorporated. You don’t want to overwork the meat. Wash your hands with soap then assemble your workstation to have a tiny bowl of water, a pastry brush, a large cookie sheet, a teaspoon, a fork, your bowl of meat, and of course, your dumpling wrappers. Place a dumpling wrapper in one hand, scoop 2 tsp. 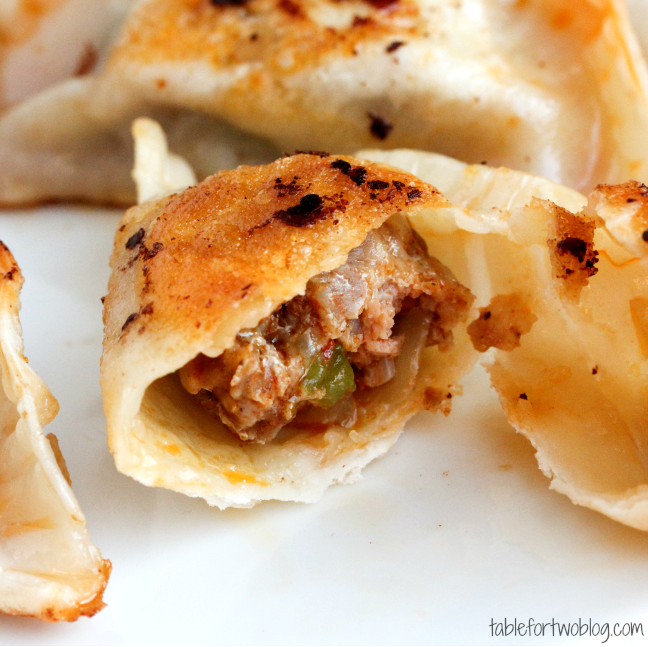 of meat filling into the middle of the dumpling wrappers. Dip your pastry brush in the water and brush the edge of the entire dumpling wrapper. Bring one side of the dumpling wrapper up to meet the other side, press gently in the middle then seal all around. Using a fork, press down the edges, sealing the potsticker. Repeat until all the meat filling has been used up. In a large skillet, oil the bottom of the skillet with 2 tbsp. of vegetable oil. Place the potstickers all over the skillet, covering as much space as you can. Pour 1 cup of water onto the potstickers, place the lid on the skillet, and turn the heat to medium high. Let the potstickers cook until all the water has evaporated, about 7 minutes, then let it sear for another 2-3 minutes. Through all this, do NOT touch them! Remove the lid and flip the potstickers. You may wish to remove them at this time or sear the other sides of them. Whisk together the flour, salt, paprika, chili powder, red pepper flakes, and garlic powder in a shallow bowl. In another shallow bowl, whisk together the egg whites, buttermilk, and a dash of hot sauce. Add the panko bread crumbs to a plate or shallow bowl. Dip the onion ring in the flour mixture, then the egg, then the panko bread crumbs. Repeat until all the onion rings are coated with bread crumbs. Lay in a single layer on two baking sheets covered with parchment paper. Bake for 12 minutes and then carefully flip and bake for an additional 10-12 minutes. 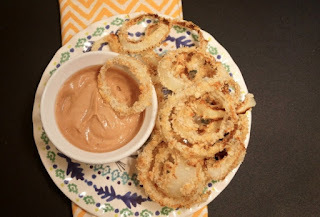 While the onion rings are baking, mix together the barbecue sauce and yogurt to make your barbecue dipping sauce. Preheat oven to 400°F. If using fresh spinach, heat olive oil in large sauté pan over medium heat, add spinach and wilt. Remove to plate to cool. Squeeze excess water from spinach. Set aside. 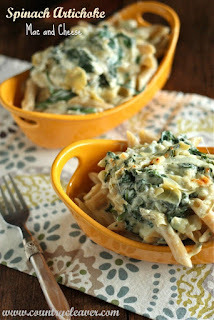 In small bowl, combine half of drained spinach and half of chopped artichoke hearts. Stir in softened cream cheese and ½ cup Parmesan Cheese. Stir in shallots and 1 tablespoon garlic. Pour mixture into oven- safe baking dish and bake for 15 minutes or until the mixture is toasted on top and heated through. Remove from oven; cover to keep warm and set aside. Meanwhile, cook pasta according to package directions; drain and set aside. In medium pot, melt butter and whisk in flour. Continue whisking vigorously over medium high heat until roux becomes golden brown. Add milk slowly, 1/2 cup at a time, whisking during each addition. Bring mixture to boil. Add mustard, pepper, 1 tablespoon garlic, remaining cheeses and sriacha sauce. Stir in reserved spinach and artichokes, mixing until evenly incorporated. Pour pasta into cheese mixture; mix to ensure all pasta is coated evenly. Plate and top with a generous spoonful of warm spinach and artichoke mixture. Serve and devour. Wow those potstickers look incredible! I am totally printing that recipe out and making it sometime soon!